Back in October, we wrote a post called “Affordability beyond the median.” While most discussions of housing costs measure based on a city’s or neighborhood’s median price, that’s not all that matters. After all, the median is simply the home for which equal numbers of other homes are more and less expensive. That may be a good definition of “typical,” but it can make us forget that most homes don’t cost the median: they’re either more or less expensive. And it matters just how much more and less expensive they are. In other words, it matters how much housing prices vary. A neighborhood where every home costs $400,000 will have the same median price as a neighborhood where half of all homes cost $400,000, a quarter cost $150,000, and a quarter cost $650,000. But only the second neighborhood has a large number of homes that might be affordable to people with moderate incomes. In fact, if we’re especially interested in affordability for people with lower incomes—who are likely to be buying relatively cheaper housing no matter the median cost—then we should also care about how much relatively cheaper housing costs. To illustrate the problem, we compared the West Ridge neighborhood in Chicago with suburban Flossmoor. Both have very similar median housing prices, right around $250,000. But a house at the 25th percentile price in West Ridge is much more affordable than one at the 25th percentile price in Flossmoor—and it’s probably not a coincidence that West Ridge is much more economically diverse. Since then, we’re pleased that at least two researchers have published their own, more nuanced looks at housing costs. First, John Ricco, at his own blog and then at Greater Greater Washington, used our analysis as a jumping-off point to create an interactive chart of housing price curves across neighborhoods in major American cities. Importantly, these curves show the distribution of median rents by ZIP code—not the 25th percentile prices, as we did. Still, by breaking down costs within cities, you can see differences in housing cost dynamics that you can’t with just a citywide median. Comparing Chicago and Atlanta, for example, shows that two-thirds of the residents of both cities (the numbers along the y axis) live in ZIP codes where median rents are almost identical (the numbers along the x axis). But in the top third, Chicago pulls dramatically away from Atlanta, so that while nowhere in Atlanta has a median rent of over $1,433 per month, a full 10 percent of Chicagoans live in ZIP codes with median rents that high or higher. Another fascinating report comes from Eric Scharnhorst, an analyst with the real estate website Redfin. Scharnhorst’s work actually predates our October post, though it has only recently been published. In that study, Scharnhorst divides neighborhoods in 20 cities into three types: “high-end,” “affordable,” and “mixed.” In a high-end neighborhood, there are at least three homes that are unaffordable to a median-income purchaser for every one that’s affordable; in affordable neighborhoods, that ratio is reversed. (A home is considered “affordable” if a household earning the median income for their metro area could buy it without paying more than 30 percent of their income.) Any neighborhood that didn’t reach either extreme was labeled mixed. Like Ricco, Redfin’s study is looking at a slightly different question than we were: their hypothetical purchaser is middle class, while we were more interested in low-income households. But it contributes to an attempt to see housing markets as too diverse and complex to be summarized with a single number. 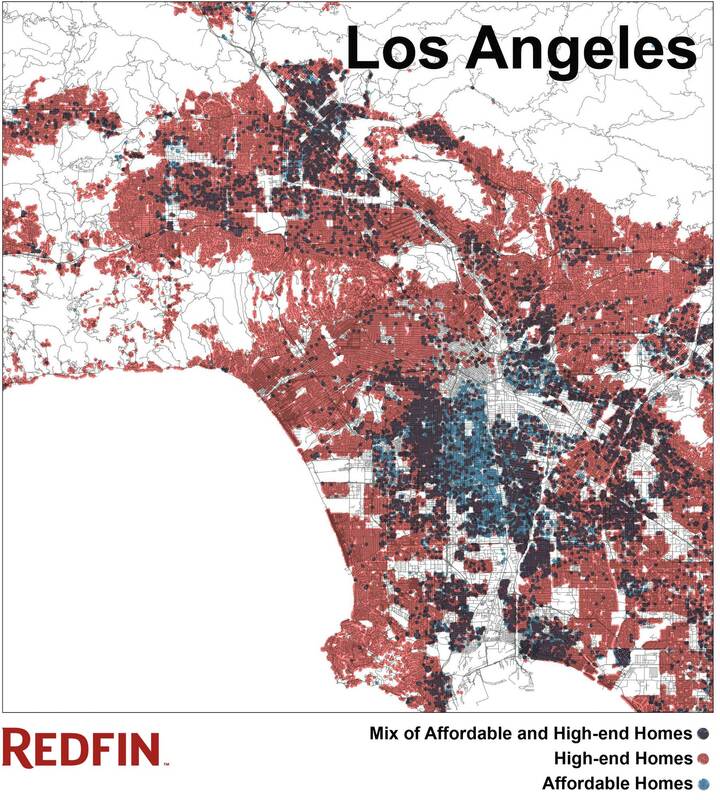 These maps show how different affordability patterns can be from one metro to another. 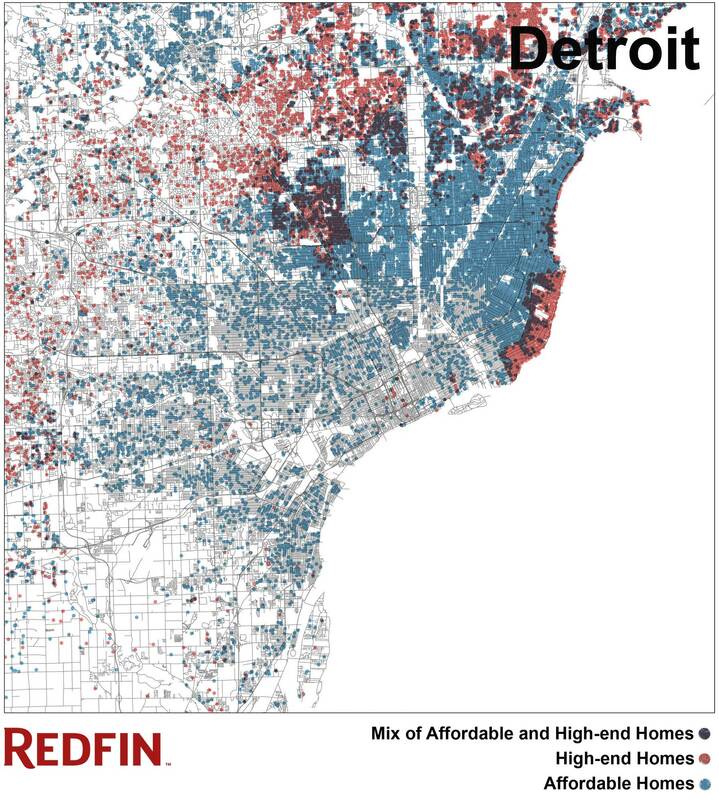 In Detroit, the vast majority of neighborhoods are “affordable,” except for a ring of high-end communities in the outer suburbs and in the “Grosse Pointe” suburbs east of the city along the riverfront. Most of the handful of mixed neighborhoods are in the inner suburbs. In Philadelphia, there’s more of an even divide between affordable and high-end neighborhoods. Mixed neighborhoods are found in inner suburban/outer city neighborhoods, as well as throughout the inner urban core. In Los Angeles, most neighborhoods are high-end, with an “affordable” corridor flanked by mixed areas south of downtown. In addition to giving residents, advocates, and policymakers a better handle on the state of housing costs in their cities and neighborhoods, it’s notable that in most cities, the largest concentration of “mixed” neighborhoods are in central cities and older suburbs—indirect evidence for one of our hobby horses, which is the way that a diversity of housing types (small homes, large homes, apartments) can foster a diversity of people, along economic and racial/ethnic lines. 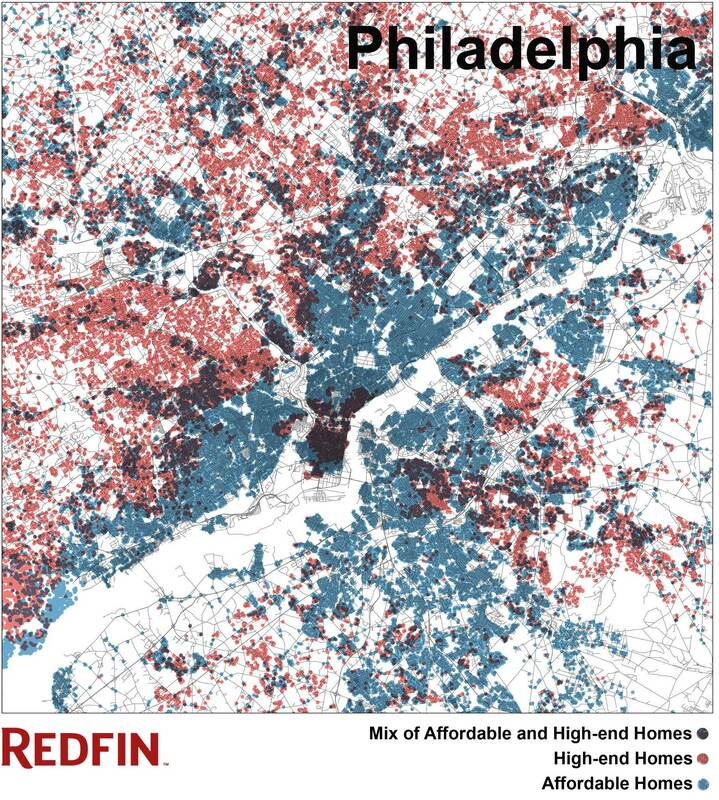 As these maps show, that housing diversity is more likely to be found in central cities. Both Scharnhorst’s and Ricco’s analyses and visualizations are worth spending some time with. Check them out!